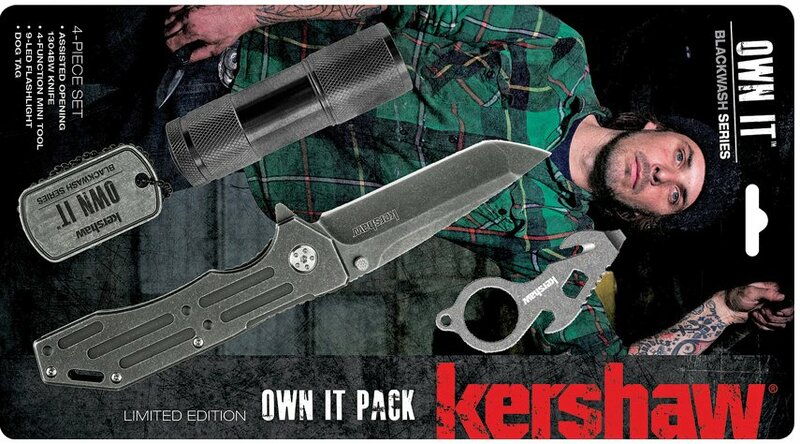 Own It Knife Light Pack - Four piece set includes knife, mini tool, flashlight and dog tag. Kershaw 1304BW knife. Knife is 4 3/4" closed linerlock with 3 3/4" BlackWash finish assisted opening stainless tanto blade. Grooved BlackWash finish stainless handles with lanyard slot and pocket clip. Mini tool measures 3" overall and features a flat head screwdriver, cord cutter, oxygen tank wrench and bottle opener. Flashlight measures 3 1/3" overall. Aluminum casing with 9 LED lights. Limited edition Blackwash series dog tag with ball chain lanyard. Hang packaged.